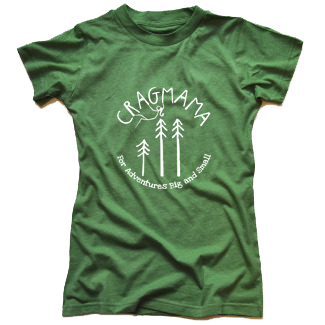 Since the start of Cragmama, I’ve been blessed with the opportunity to cross paths with several strong and amazing women – women who are not content to settle for the status quo of abandoning adventure at the first sign of an expanding belly. Women who are committed to getting not just themselves but their whole families outside enjoying nature – whether its climbing, biking, hiking, or building treehouses! So I’ve decided to start a new section on my blog dedicated to all the mamas out there who believe that starting a family doesn’t mean an end to outdoor fun. 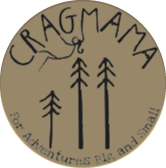 Interviews with Moms that Rock will be a place for stories from real women who embody what the spirit of Cragmama is all about! Read on, and prepare to be inspired! 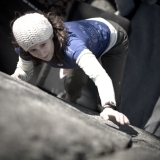 First up is Aimee Roseborrough – I first “cyber-met” Aimee a couple of years ago, when she had some encouraging comments for me on one of my trip reports about climbing during pregnancy. Since Cragbaby’s arrival we’ve been swapping tips and stories via email with regards to kids at the crag. Aimee climbs HARD. Really hard. And both her and her husband Kyle are blessed with flexible enough schedules that they can go on several extended climbing trips throughout the year. 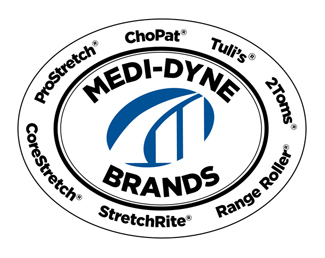 Aimee works by day as a Physical Therapist, and along with her husband runs a website that is a great resource for injured climbers. 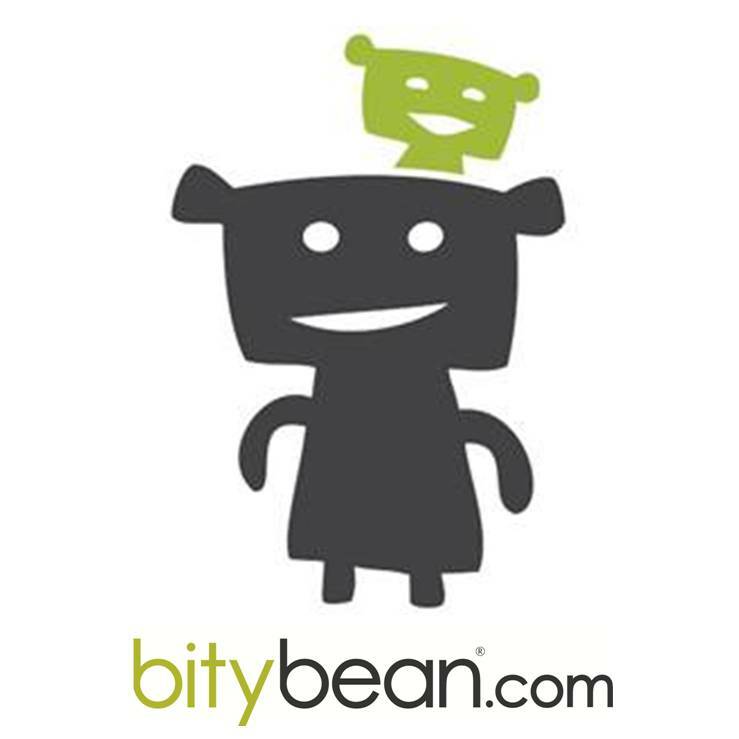 She also has a personal blog documenting all her travels and adventures. It would be nice if maybe one day we could actually meet in person and share a rope together. Here’s her story. 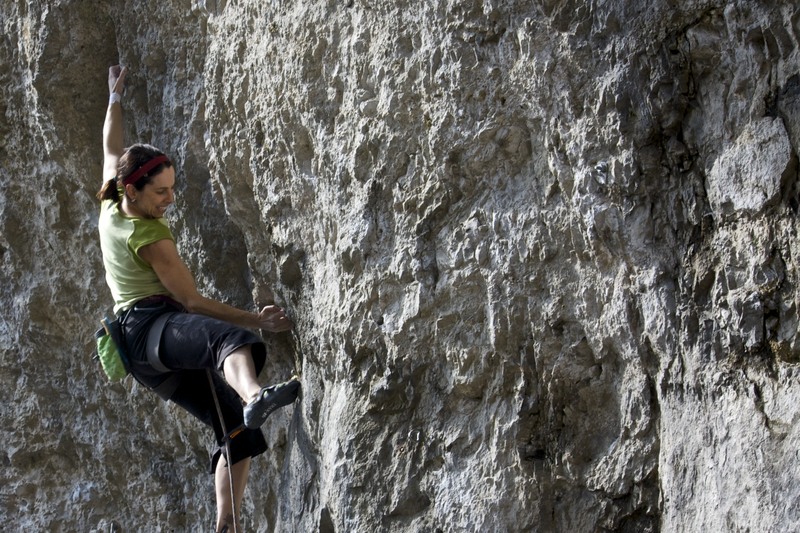 Aimee cranking in Frankenjura, Germany - I wish I looked that relaxed on 5.12d! Favorite Climbing Area: Tough question, but I think Spain is my favorite place to climb. There’s a crag called Sella near Valencia that is amazing tufa limestone. It’s near the coast, so it’s good for kids and I love the Spanish culture. We spent 5 months there last Spring and found plenty of kid stuff on rest days and the crag is super kid friendly as well. Proudest Climbing Achievement: Sport-climbing – Climbing 8a and sending Heinous Cling, a super run-out 12c at Smith. Trad-climbing- hula hooping on top of Ancient Art in Moab, UT. How old were your kid(s) when they first went to the crag? At 6 weeks old we took Ella on her first climbing road trip to Red Rocks, NV. She did great, but it took us about twice as long to drive out there because of having to stop to nurse. Does Ella climb? She climbs a little, mostly in the gym. 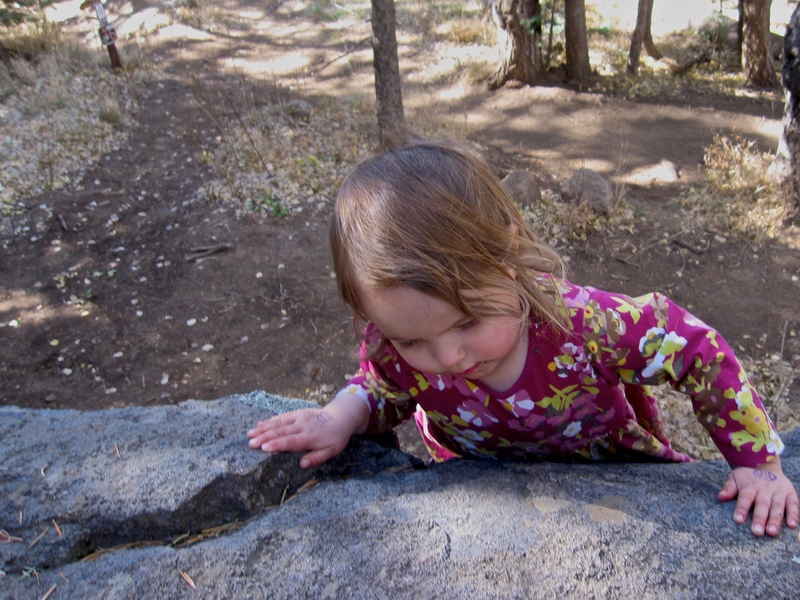 She started on the “baby wall,” a small bouldering slab at our old gym, at about 2. Today she made it to the top of the wall in our new gym for the first time! 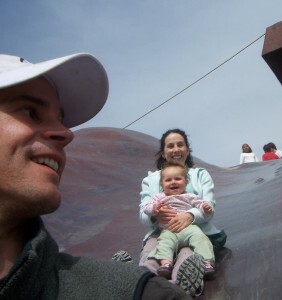 Has your attitude with regards to the risks in climbing changed at all since having a child? I may be slightly more cautious when actual danger is involved, such as climbing to the first bolt or topping out a boulder problem. I’m more likely to just down climb rather than top out a tall boulder because I know how hard it would be to take care of my child with a sprained or broken ankle. 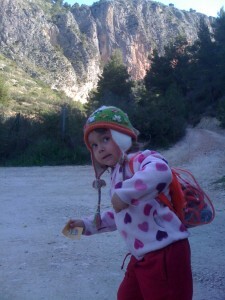 What is the most challenging aspect of family climbing trips? Finding places where there are fun kid activities on rest days. When Ella was younger the hardest thing was getting in her nap because she had a hard time napping at the crag. 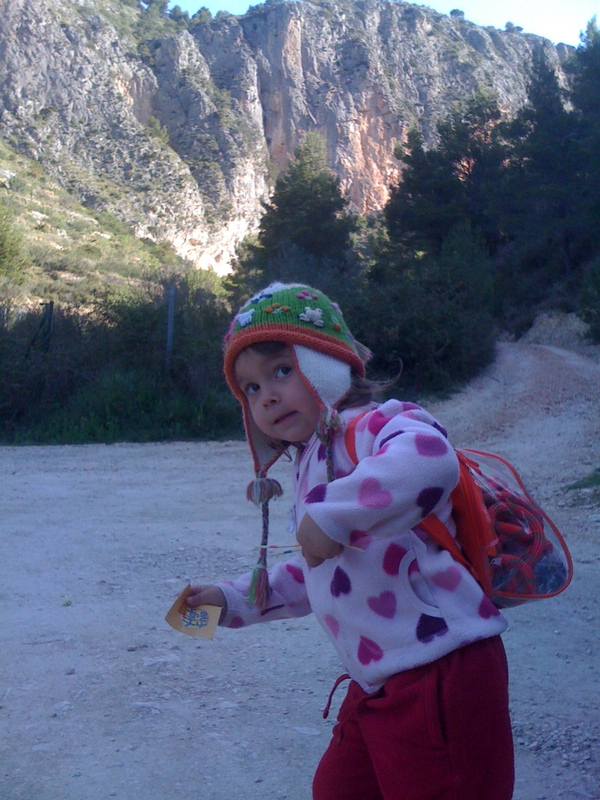 It’s also a bit challenging to hike out to the the crag and back because Ella is naturally a slow hiker. She can go faster, but just doesn’t want to, which can be tough when we’re carrying heavy packs! What is the most rewarding aspect of family climbing trips? Getting to spend quality time with my daughter and instilling a love for the outdoors in her. If you could offer one piece of advice to other mama’s out there what would it be? Start early and don’t be intimidated by the amount of gear you need. Just get out and try and it will get easier. Some days will be a wash and you just have to be able to go with the flow and know you’ll have a better day next time. Anything else you would like to add? Don’t underestimate the power of leaving the kiddo with the grandparents and going out with just your climbing partner (especially if that’s your spouse as well). Aimee is a refreshing rebuttal to the notion that its impossible to get back into shape after popping out a kid. I’m pretty sure you can’t climb 5.13 with flab-abs. Thanks so much to Aimee for agreeing to let me interview her – if you enjoyed her story, leave her some comment love! Wait, she can hula hoop on top of Ancient Art? Now THAT’S impressive! I’m the proud Mom of Aimee – she does rock and is a fantastic Mom. 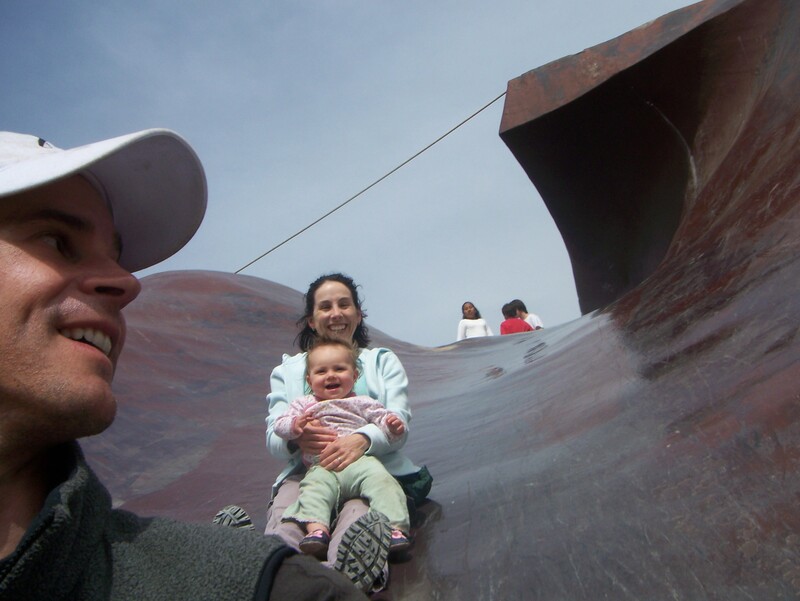 Being the proud Grammy of Ella, we tell Aimee & Kyle they can leave the little sweetie with us and go climb anytime. But sometimes they even drag us out to play at the crag with her there. Thanks for sharing the link, Jackie! The answer to the question to my mom would be no, but I did get my dad in a harness one time at the climbing gym! Great that her daughter is portable and travels well. I hope she remembers some of her outdoor adventures as she gets older. Some of my fondest memories of my children’s adventures when they were little are barely recalled by my now teenage girls – so sad. They only know it happened because of the photographs. I’m so glad I took lots of photos! The tough part is when her daughter starts school. Unless she’s home schooled, that really will limit her ability to do many long trips with her kid. During the school year, we only got off a week at a time at most. Any longer trips had to wait until summer, when conditions at many crags are often too hot. Video of Aimee climbing in J Treee, filmed by Teresa Delphin. They’re going to be on Good Morning America!